The biggest stereotype about robotics is…that they’re some kind of futuristic thing, like we’re not swimming in robots right now, like there’s not enough computing power in a fuzzy logic rice cooker to dwarf some of the room-sized computers of the ENIAC era. Can a rice cooker be a robot? Of course it can! It decides when to stop cooking your rice, it changes in response to things in the environment. Lots of people can’t recognize robots that they’re using. I think that’s the biggest stereotype. The biggest stereotype about robotics is that robots will run amok killing humans. This stereotype originated with the first appearance of the word “Robot” in Karel Capek’s play RUR, published in 1920, and continued over the decades, in myriad robot stories and films, right up to the “Terminator” series and beyond. As with most stereotypes, there is a nub of truth. It is reasonable to be wary of autonomous intelligent robots (or the future prospect of autonomous intelligent robots). Technology does fail, from time to time, or is misused. But people are also flawed and have, over the millennia, killed hundreds of millions of fellow humans in genocidal and tribal atrocities. Autonomous intelligent robots, including military robots, can be designed with value-driven logic to provide them with a code of ethics and morality. Their behavior can be more rational, more exemplary, and more humane than that of humans. Robert Finkelstein PhD ’88, president of Robotic Technology Inc. 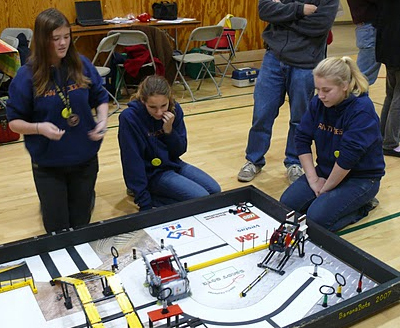 There are two stereotypes that strike me in Robotics…. One is Data from Star Trek TNG, the Holy Grail of Robotics and the other is the PackBot from iRobot, the extension of the human in the loop to deal with high risk packages; high risk packages being objects that put the human in the safe loop in the first place. Of course Rumba is the first thing one may think about as Robots from iRobot but the technology of the Rumba, while autonomous in behavior, is more closer to the actions of a cockroach. Data is the ultimate in autonomous robotics and inspires many of a roboticist. The reality of today is that roboticists are happy to be at the learning curve of the autonomy of a newborn when it comes to robotics. We are learning more and more of the inner workings of human perception and cerebral decision making but in reality, we have not passed beyond the characteristics of an advanced cockroach or an application with a defined order of rule sets to follow. In the next 10 years, we will gain tremendous information from the confluence of NeuroSciences, Human Cognition, Autonomous Robotic Behavior, Machine Vision and Information Management. Perhaps then, the elements that fill in the roadmap to Data will emerge and the evolution of robotics will take a great leap forward. I’m excited to participate in the next decades of robotic evolution.